The fifth day of the Heartland series dawned bright and sunny as NRG made haste to Daventry to defend their position against the home team, Vendetta Vixens. This was the first game played by NRG after suffering the devastating loss of teammate and friend, Louisey Rider, and everyone was determined to do their best in memory of her. 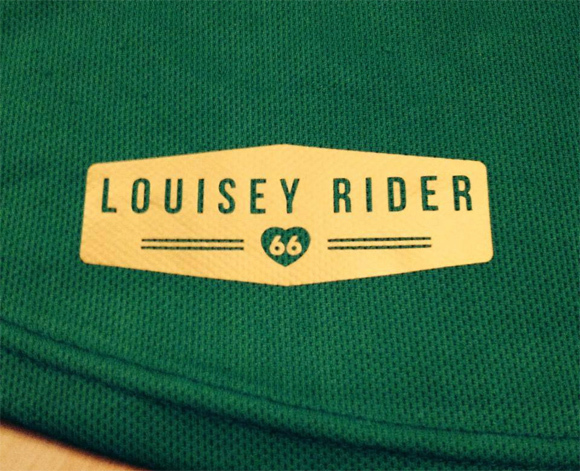 A small pocket of green shirts, with glitter, stars and #66 represented Louisey – a poignant and beautiful reminder of the absent star jammer. With the job in hand, the team rolled on track and the mood shifted to fierce determination. NRG went for success, and boy did they deliver! The first jam saw Damndrea up against the Vixens’ #07 jammer, Law. Damndrea got off to a good start by slipping through the pack to gain lead but with the opposing jammer close behind it was called with no points scored. A power jam in favour of NRG saw the determined Hell’n’back scoring the first points of the game. 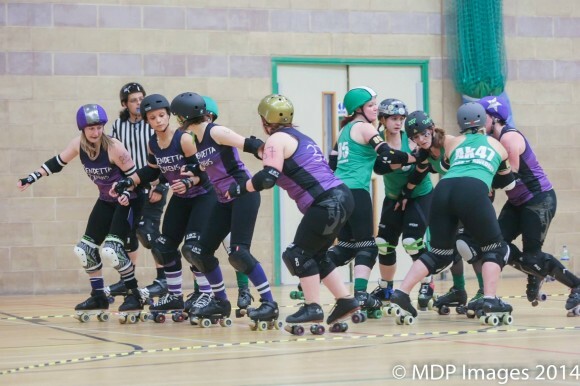 The first half followed a similar pattern with Natastrophe, Damndrea and Hell ’n’ Back reliably securing the lead, closely followed by Vixen jammers: Law, Lo-Po and Lucy Go-Lightly, leading to frequent tactical calling by NRG. Fantastic blocking was demonstrated throughout the game by both teams, strong walls from NRG succeeded in holding the opponents just long enough for NRG to repeatedly gain that lead jammer status. An excellent sweep by Gem Aargh across track during the 6th jam, cleared the way for Natastrophe being held solidly by the Vixens’ wall. Jam 11 could have been a turning point for the home team due to an NRG jammer penalty, but the subsequent appearance of the Vixens’ jammer in the penalty box led to a lost opportunity to even the scores. There were a few solid hits at Damndrea towards the end of the first half which she absorbed well in her usual effortless style. 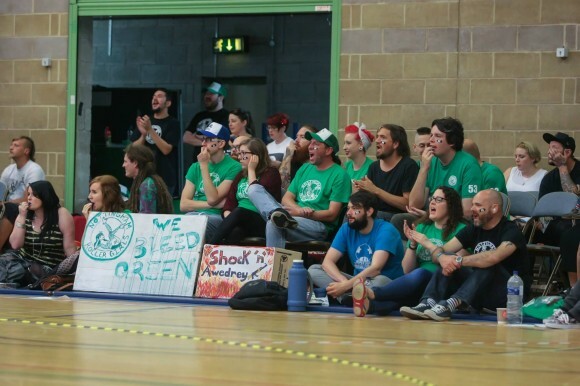 The outstanding moment of the first half (and arguably the entire game) came when Law – with seconds left on the clock – performed an unexpected apex jump past the entire NRG wall, culminating in an impromptu round of applause by the Nottingham team. The first half drew to a close with Vixens on 28 points and NRG comfortably ahead with 114. At the start of the second half the Vixens came out fighting but unfortunately picked up jammer penalties, leading to NRG increasing the lead. NRG’s strategy of accumulating points with tactical ‘calling’ then became successful in keeping the lead secure. 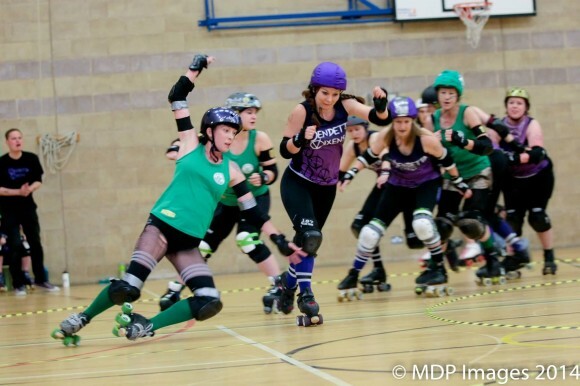 Along with jammer prowess came some impressive blocking skills with Lauren Forcement recycling Lucy Go-Lightly and forcing her to work super hard to earn those points! The Ruth Hurts and Lozferatu also demonstrated outstanding and effective chest-blocking skills to help facilitate a win for NRG. One final power jam to NRG saw Natastrophe make use of an opportune moment which meant Damndrea was able to display some jammer/blocker hybrid work in the subsequent jam, holding back The Sweeney to limit her scoring points. 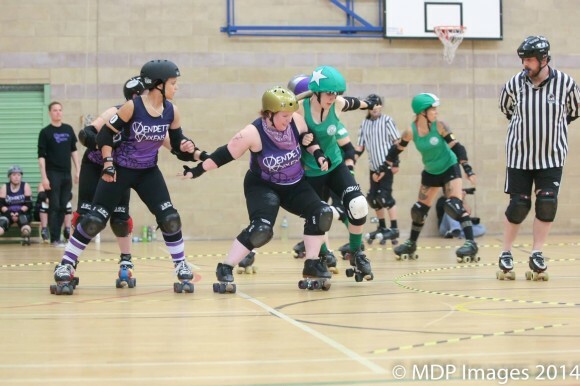 The final jam of the day and Gem Aargh showed her versatility on track as she gained lead jammer status to secure 5 extra points before the final whistle. 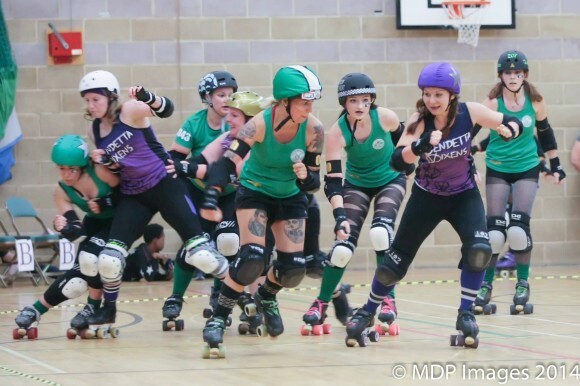 Final scores: Vendetta Vixens 69 – Nottingham Roller Girls 196. Emotions ran high on the day and the elation of winning, mixed with sadness for a much-loved friend, led to a few tears from NRG fans and players alike. The traditional high-fives were followed by a wonderful #66 seconds of noise dedicated to Louisey (who never could keep quiet for a minute’s silence). We all imagined her smiling face, joining in the sweaty hugs and congratulating her teammates on a well-deserved win. It was by no means an easy game, but as always, NRG brought their A-game and worked hard for their victory.